A visitor can get to know the mainland and the Monasteries of the island of Hydra with donkeys or by walking.There is no other transportation to the Island. As a start point the Church of Saint Konstantinos of Hydra, we follow the route, which leads to the Monastery of Prophet Elias. 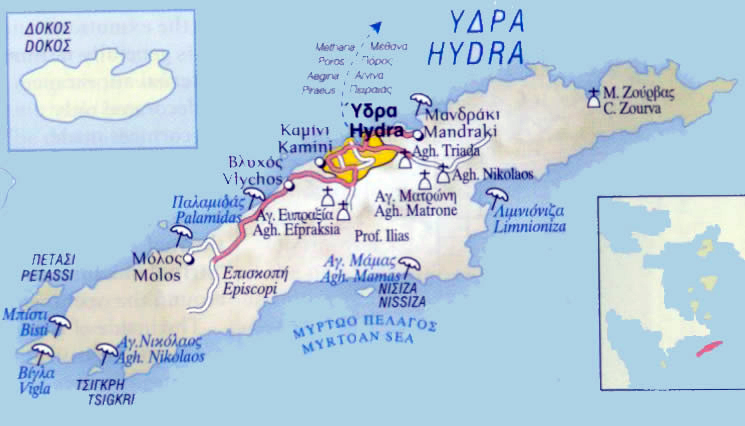 Other Monasteries that Hydra has are the ones of Saint Foteinis, Saint Matronas and Holy Trinity. Because of the lack of transportation in Hydra, we have to use sea transportation and sea taxi in order to reach to the beaches of the island. With boat or ship or sea taxi, we start from the main port and we reach to the place Vliho. Next we have got the beach of Molos, to the south-west side of the island and Kaoumithi, a beach with thick sand. From here we continue to cove Bisti, with the large beach and close to it we can see the beautiful beach of Saint George, surrounded by pine trees and to the hill there is its Church. The round of the island, as an excursion, is being done daily, with boat, starting from 11.00 in the morning from the main port. In August and July with boat you can go to the festival of Epidauros.